Feel the burn: 400 miles of cycling and skiing has a way or working those legs. Joel Oberly photo. What do skiing and cycling have in common? Well…not that much, unless of course you are using a bike to get from peak A to peak B. It may sound absurd but for a group of four adventurers this vision became reality when they decided to bike pack 100 pounds of backcountry ski and snowboard gear, food, water, and camping gear parallel to the Eastern Sierra all the way to Whitney Portal via US Route 395. At the brim of the east side of California the Eastern Sierra stand as some of the most burley peaks in the lower 48. A vast array of rocky drainages, chattery stream crossings, no fall zones, steep chutes, and infinite corn possibilities meant the sky was the limit for this human powered posse. 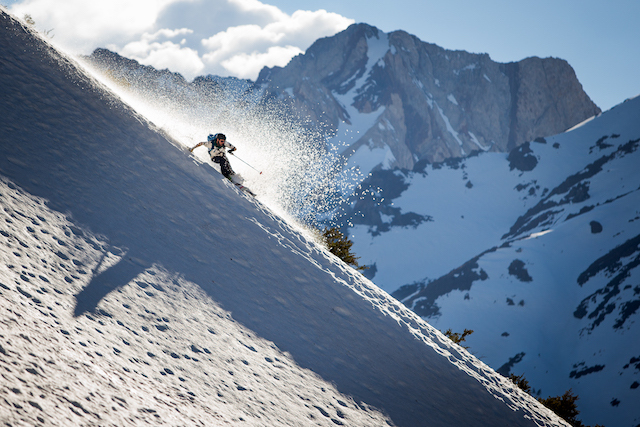 Starting in Reno and ending atop Mount Whitney meant covering over 400 miles of meandering highway mixed with consistently chopped up dirt roads, 8,000 vertical feet of biking in just the final 100 miles; not to mention the hours and miles logged in ski touring ascents and descents. We caught up with these lively biking rebels to get the behind the scene scoop on the camaraderie and the mentally and physically taxing voyage that will forever be engrained in their memories. How did this project come to be? Did it take any arm-twisting for you and others to join on? Max Hammer: The trip was in my head for a variety of reasons. First, I love the Sierra Nevada as my new home. Second, because I'm new to the area, I was looking for new friends to adventure with. The trip offered me a chance at inviting folks I didn't know very well, but wanted to get more quality time with. 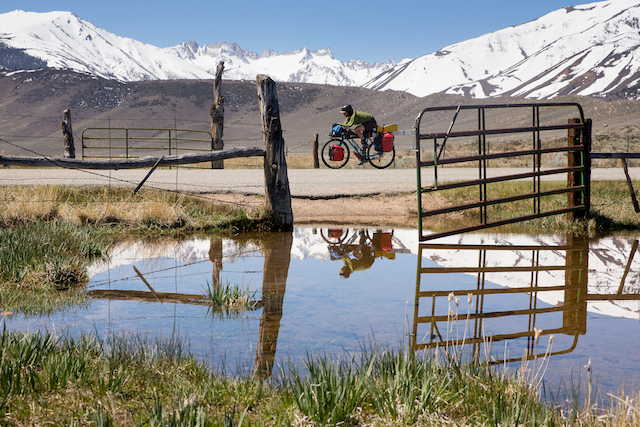 Nick Russell: I had only met Max a few times prior, but earlier in the winter Gray and I got an email from him asking if we wanted to go on a bike trip though the Eastern Sierra. It was an easy yes for me and I didn’t really give it much thought. I didn’t know if we needed road bikes or mountain bikes- I actually didn’t even own a bicycle before we went on this trip. Joel Oberly: This was a brainchild of Max. He pitched it to me maybe about a year prior to the trip. I jumped in 100 percent immediately without actually knowing what he had in mind, so there was no expectation. I had no idea what he had in mind, but a bike/camp/ski trip sounded like a great way to pass the time. In the film you guys talk a bit about the craziness and how the whole crew sort of helped each other out in continuing to push on; were there any factors that added to the madness? MH: Numerous quotes stick out in my head. First being, "It's just like riding a bike." This is the obvious answer to most life questions, but definitely useful in a crew that has virtually zero bike tour experience. The biggest mantra we had was, "This is the last hill... until the next one." I think if we had known how hard the whole trip would have been beforehand; we might not have even tried. But, step-by-step if wasn't so bad. Insanity has a tendency to set in when all day is spent in the saddle. Andrew Miller photo. NR: Oh man, the jokes came and went and honestly probably never even made sense. But it’s safe to say that food and hot springs were the major motivators to get from A to B. Were there any obstacles that you thought could’ve potentially put a halt to the trip? MH: The first obstacle was finding bikes for everyone; but some of the crew didn't even have a bike! We were really lucky to find Eric Pollard, who was a bike rep at the time. He really hooked it up as far as bikes and bags and touring knowhow. I still ride the bike he wrangled up everyday. The first day was by far the hardest. The wind really hammered and pretty much destroyed us, sending riders into the oncoming lane, off into the sage, bringing us to complete halts, and even threw a couple guys into a fence. NR: We all saw the forecast, but for some reason we chose not to wait a day and ignorantly pedaled off into a gnarly headwind for 50+ miles. Somehow we made it through that first day without quitting. JO: Nothing specifically. Continually pushing forward was the madness, we were unsure of how far we could get and we all chipped in on picking each other up when someone was struggling. Somewhere along the way we just accepted the unspoken truth that we’re all in it together. What was the single most important item on trip besides the bikes and ski/splitboard gear? MH: Kickstand. No joke. We would have had a hell of a time with all that weight on the bike without a proper kickstand. The light at the end of the tunnel: After all that bikepacking, the crew knew they would get some fresh tracks. Joel Oberly photo. NR: The chamois. And hot sauce. JO: Aero press for coffee in the morning. Everything was essential to the trip I think, we all cut out anything unnecessary and had bare essentials with us. The last few days looked insane–biking to Whitney, climbing up, and shredding down. By that point were you able to reflect on the high and the lows of the trip? MH: There was a handful of memorable moments. Riding through Reno with all our gear was hilarious and exciting all rolled into one brisk morning ride. The feeling of a first accomplishment in terms of getting to the peaks we wanted to ride was great. Making it to Whitney Portal was wild. Honestly, once we made it to Whitney Portal–which demands a serious bike effort up a steep, steep road–we knew would complete the goal. The rest of the way to the summit and ski down was just a celebration. NR: That was the highlight day for me. We were burnt for sure, but by that point in the trip we really did enter a new reality. We’d move a little slower, but it’s not like we didn’t want to be there. I had been up Whitney once before, earlier in the year, and was ready for some challenging snow. By a miracle, it had snowed a few days prior to us biking up there and Pancha Mama laid a fresh coat in the area. The mountain was virtually empty and weather was beautiful. It is so rare to get good snow on higher peaks, and the fact that stumbled on those conditions by pure luck was surreal. Everything is better in Hawaiian shirts. Andrew Miller photo. What’s next? Do your ever foresee yourself bikepacking skis again in the near future? MH: If I lived a little closer to the snowline, I would honestly bike to my ski tours all the time. As it is, that is a bit of a mission. I do intend to still bikepack with my skis though; I got a couple big ideas up my sleeve. I would also like to get the train involved! I love public transportation as much as I love biking. Frankly, we live in a world of shortcuts. More often than not, I hop into the car for both quick errands and long ones in an attempt to get where I'm going quickly. In this way, travelling is an interruption of the intended event. But on a bike, travelling is an event itself. On a bike, travel is just as joyous as whatever comes afterwards. NR: Time will tell. As you can see in the end of the film, there’s plenty of gold out there. JO: Yeah, I would absolutely do it again; the crew is what really made the trip a success though.